Our product range includes a wide range of ro repairing training classes, ro servicing training classes, ro maintenance training classes, ro plant training classes and ro assembling training classes. This training module covers water analysis issues and starts with a review of standard natural water analysis, which is deconstructed in order to demonstrate how it is built up from first principles; starting with rain (pure water) falling through the atmosphere, soaking into/onto the ground etc. The course builds from these essential components and goes on to cover the units of analysis, which are explained, as is the significance of the various components for industrial and commercial users. This module covers water pre-treatment technology and has been developed to demonstrate clearly and simply what water pre-treatment processes. This module examines the various market segments of the water treatment industry. For reviewing the particular water treatment processes that are commonly utilized by each segment. Our Workshop of 5 days is an exclusive and intensive program, which helps candidates in achieving ‘the’ breakthrough. The custom made course is committed to developing ambitious trainees to be best in the industry. The workshops train you on the powerful training of leadership techniques too. Who can be a part of this course? 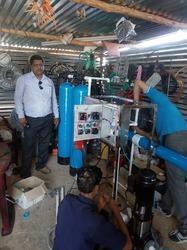 If you are passionate to work in Water Purifying Industry. Persons who are eager for a rewarding job. Managers and Sales Executives of water purifying Industry. Already working in the industry but to sharpen soft skill . We are the leading service provider in training classes. We are widely appreciated by our clients for our effective and valuable services. We have been consistently working towards building our reputation by providing the best possible. Surface Water: River Water, Lake Water, Spring Water, Sea Water. Underground Water: Well / Borewell Water. Ultra Pure Deionised water Purification. The combination of the above treatment technologies will be disclosed and suitably discussed and trained at the time of the training. The following are the individual product details.